We want to make delivery of your furniture as timely, easy, and inexpensive for you as possible. Ask us about delivery while discussing your purchase to receive specific information. In most cases we will deliver furniture in to your home. Deliveries can be scheduled for most weekdays to the first floor of your home. Typically, we are unable to move other large or built-in furniture that is in the way. We are unable disconnect or re-connect stereo, Internet or other electronic devices. Delivery of projects to first-floor residences within 25 of miles of our shop is included on orders totaling over $750 before sales tax. Fees may apply for certain deliveries inside of 25 miles. For example, deliveries to high-rise condos which take additional time or to other than the first floor of your home; heavy or abnormal-size projects that require additional manpower, or projects that require extensive on-site assembly. 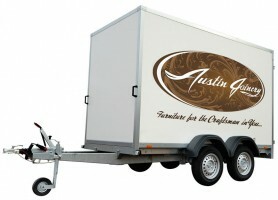 Austin Joinery regularly completes deliveries as far as 100 miles from our shop. For deliveries beyond 100 miles, Austin Joinery™ has partnered with furniture moving companies that can deliver your order with the care it deserves. Under these circumstances we offer in-house crating of your purchase, as well as different levels of delivery services ranging from Curbside Delivery to White Glove delivery services we can schedule for you. This service applies to deliveries Austin Joinery cannot complete in-house. We will arrange for your furniture to be brought into your home, placed, and assembled. All packaging materials will be removed by delivery personnel. Delivery personnel cannot move your existing furniture, attach anything to walls, or connect electronic equipment unless such services have been discussed prior to delivery with your salesperson. This service applies to deliveries Austin Joinery cannot complete in-house. The furniture will be crated by the Austin Joinery and delivered curbside by a third-party furniture delivery service. You are then responsible for inspecting the delivery curbside before accepting the delivery, unpacking and disposing of the shipping materials, and placing the furniture in your home. If you choose to pick up your furniture yourself, please contact our shop in advance to arrange a pick-up time. Be sure to also confirm with us what you need to bring to properly transport your purchase.